And on the thirteenth day of Christmas the eleven pipers piping attempted to out pipe the twelve drummers drumming thus inspiring the nine ladies dancing to river dance. Unfortunately, the lovely dancing ladies pirouetted right into the eight maids a milking and upturned their milk buckets over the poor swimming swans. The ten lords-a-leaping where a-leaping everywhere which was just too upsetting for the two-turtle doves, who being simple birds of peace flew off in search of it. Six hungry corgis began gathering all the goose eggs with visions of scrambled eggs dancing in their heads all the while wondering if french hens would taste anything like french toast. Said french hens fled for their lives taking accompanied by the incessant calling of four rather indignant birds. The five golden rings, it was discovered, did not at all work for a hardy game of toss the ring around the partridge but did a lovely job of knocking loose an innumerable amount of over-ripe pears that created a lovely post-holiday slime over every one. My annual, big (for me anyway) Christmas painting. 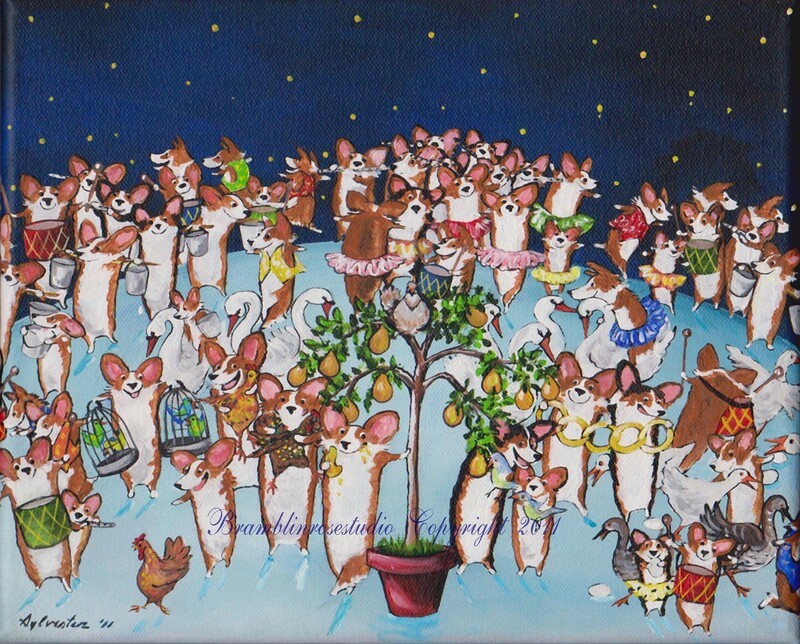 I haven't bothered to count all the corgis--after painting it, I'm not sure my eyes can handle the strain. I leave that to you stalwart corgi art enthusiasts. 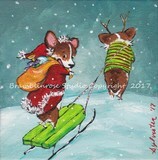 ;) Original 8 x 10 gallery-wrapped mini painting in the private collection of J. Bostwick.